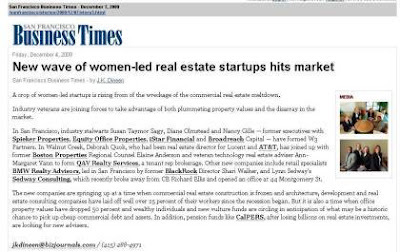 A crop of women-led startups is rising from of the wreckage of the commercial real estate meltdown. Industry veterans are joining forces to take advantage of both plummeting property values and the disarray in the market. In Walnut Creek, Deborah Quok, who had been real estate director for Lucent and AT&T, has joined up with former Boston Properties Regional Counsel Elaine Anderson and veteran technology real estate adviser Ann-Margaret Vann to form QAV Realty Services, a tenant rep brokerage.